Over the last five years, India's defense spending has increased significantly due to the need for modernizing defense equipment, rising terrorism and strengthening border security. The defense spending reached $53.8 billion in 2015, growing at a CAGR of 3.1% during 2010-15, resulted in the demand for equipment such as night vision devices (NVD). The market for NVDs registered demand from tri-services (Army, Air Force and Navy). NVDs are extensively getting deployed for border security & surveillance applications. Presently, 2nd generation NVDs accounted for majority of NVD market in India; however, the trend is now shifting gradually towards 3rd generation NVDs. Amongst all applications, army application segment acquired largest revenue share owing to deployment of NVDs for border security, counter insurgencies, surveillance and other military applications. 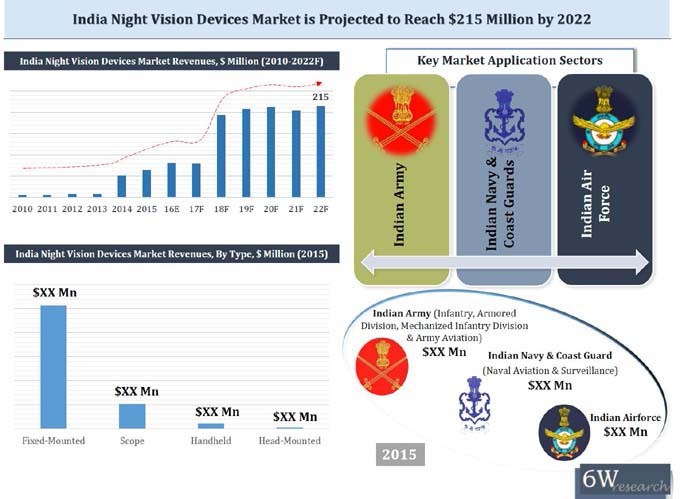 Over the next six years, army application segment is forecast to grow at a relatively higher CAGR attributed to increasing coverage of NVDs toward surveillance application coupled with deployment of handheld NVDs for infantry units. The report thoroughly covers NVDs market types and applications. The report provides an unbiased and detailed analysis of the on-going trends, opportunities/ high growth areas, market drivers which would help the stakeholders to decide and align their market strategies according to the current and future market dynamics. 12.2	Thales India Pvt. Ltd.
12.3	Tak Technologies Pvt. Ltd.